Elder Scrolls IV: Skyrim will be coming out on November 11th, 2011 - being approximately 4 months away from release. The game will be released for Computer, Xbox360 and Playstation 3. 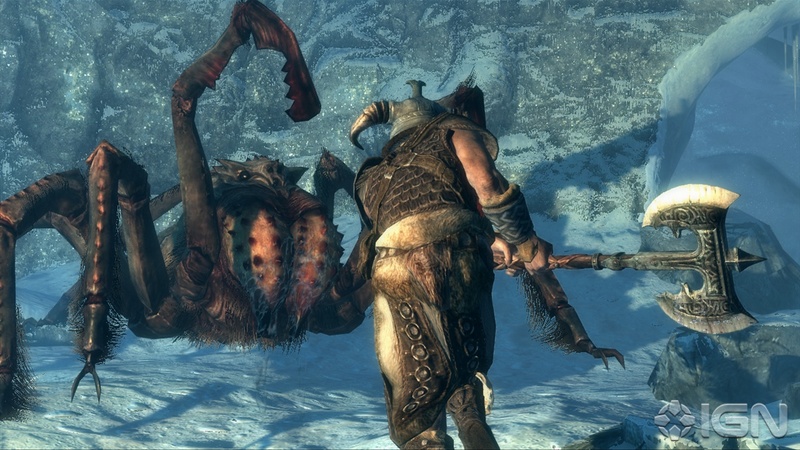 Much has been written about Elder Scrolls V: Skyrim already. The hype is quite big. In my opinion Bethesda has been quite quiet about the actual gameplay footage. Sure, they have given out loads of interviews but each of them has been repeating pretty much same things without new video material. They didn't really release many photos of the game and only official Trailer was given out about gameplay video, untill E3 2011 they showed some more of the actual gameplay. Ok, so the hype around the game is very big as are the expectations. For what I've seen about the video footage I would say the game will not quite live up for the hype. But that's really not the problem, the problem is people propably expect more from this game than is actually possible. 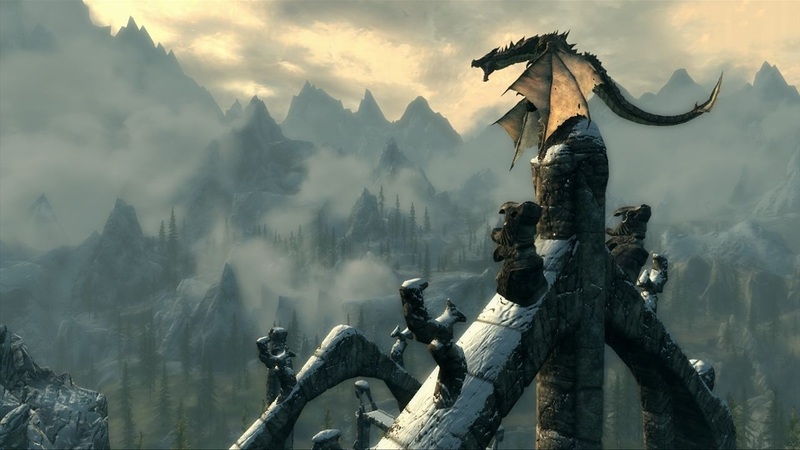 Since Skyrim was made for multiple platforms including PC, XBOX360 and PS3 meaning it has to run on all of them - there will be some limitations because of the old hardware on XBOX and PS3. If it was made only for PC, they propably had more options especially graphically but also gameplay wise. Am I worried because the game won't perhaps quite live up the its insane hype? Not quite. Because I'm sure that even if it doesn't, it will still be quite a blast. Actual video material does remind alot of Oblivion enchanted in my opinion, despite the rewritten graphics engine. Sure it looks nicer, but I still get slightly a feeling that much of the game is based on Oblivion. 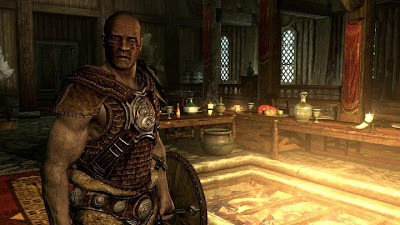 Bethesda stated that Skyrim would be a borderline between more classic RPG style Oblivion and more mystical feeling having Morrowind, but what I've seen it definetely leans more towards Oblivion. Looks to me that this game, although looks neat, will not ride to the glory with its graphical enchantments towards Oblivion. Some people have already started stating this will be Oblivion 2.0 (which isn't propably all that bad, Oblivion despite its downsides was really good game) - well graphically it might be true but there's much new in gaming system also. Main thing i noted in graphics was that models (especially human) looked much better. What do we know for sure about gaming mechanics and system? Well for starters Radiant Story should make random quests appear more dynamic. Skyrim kind of keeps track where you have visited, who have you met, and who are you hostile/friendly with. This will trigger random generated quests based for example on those settings. We don't fully know yet what all things will affect Radiant Story, but it sure sounds promising. It should spice up the quests within the game nicely, even if random quests were not that deep. There should be also living economy - every town having it's own economy based on its resources and richness. Every town should have it's own material resources (ore's, farming etc.). This means also that player can use wood and ore to create their own special weapons. Not sure yet how deep will this system be, but sounds like Skyrim will have much freedom in many things. Crafting is very welcome addition to Elder Scrolls series. Player could also affect certain town's economy by enriching it or destroying it by doing some sabotage. Combat system has been enchanted so that now you can dual wield weapons and spells in any way you want. You have two hands to use the way you like meaning you could use a dagger in one hand while casing fireballs with another - or casts different spells with each of your hands. This makes more combinations and play styles available. Bethesda stated they have also made stealth system better and more enjoyable. Character creation has also been changed, you no longer pick skills right from the beginning. You only choose the race and your looks. You will get better on what you do, and this will determine your major skills due time. There will be dragons, many of them. The game has been marketed with the dragons and they will be kinda mini-boss-fights. Dragon encounters will be random and they will be tough. When you slay one, you - dragonborn - will absorb the dragon's soul. 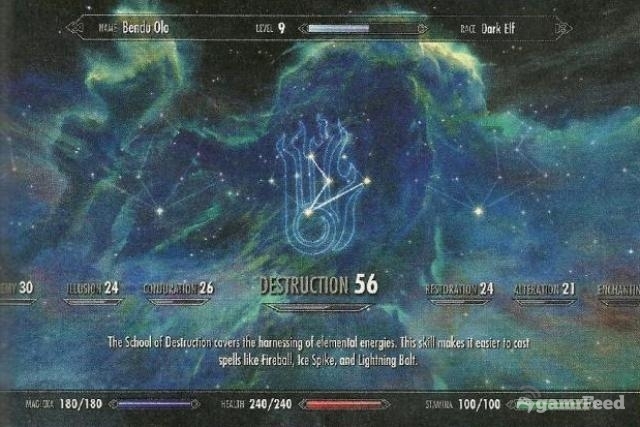 Every time you do so, you will get a "dragon shout" which is like a powerful perk or spell you can then use in combat. There will be many dragon shouts to hunt down. 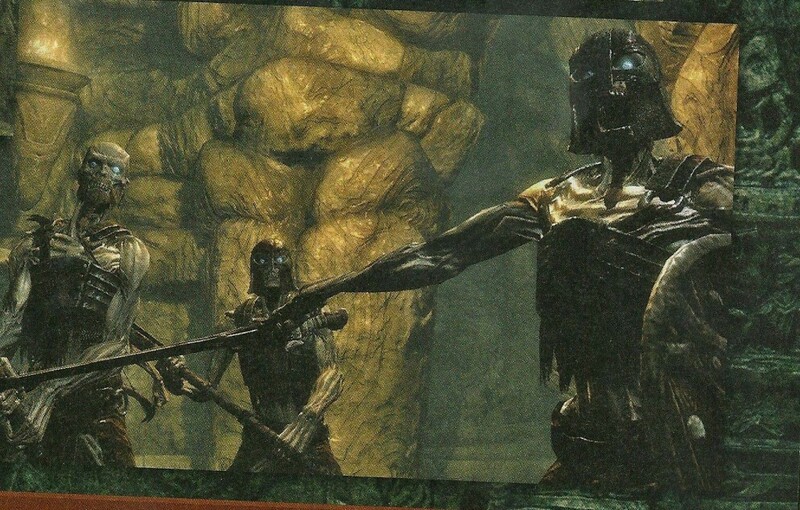 Talking about perks, they will be included first time in Elder Scrolls series. Remember them from Fallout 3 and New Vegas? Perk system in Skyrim will be a bit similar granting you perk every time you level up. I personally liked perk system in Fallout. Lets hope Bethesda is innovative with the perks. Remember generic repetitive dungeons from Oblivion (which was it's lowpoint)? If i remember correcly only ONE person did planning of all Oblivion's dungeons. How was this possible? The dungeons were made out of pre-made pieces. 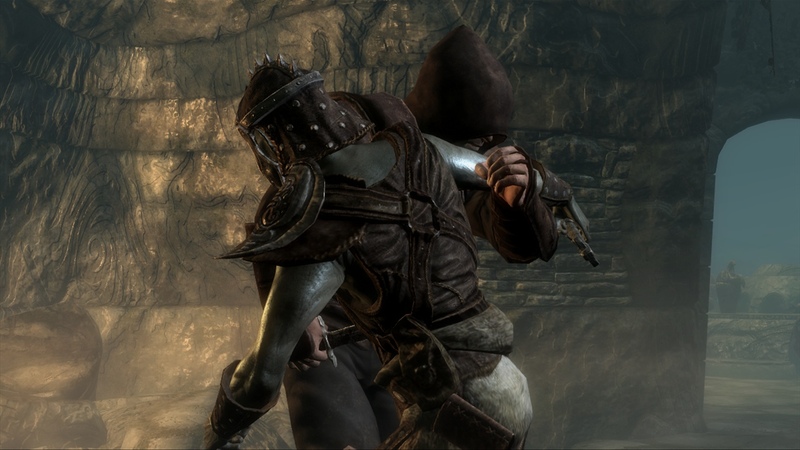 Skyrim's dungeons should be more hand-made and there will be more than one dungeon designer this time. It was six or seven designers this time of im not totally incorrect here. Sounds good to me. Hopefully this will fix repetitive dungeons issue. 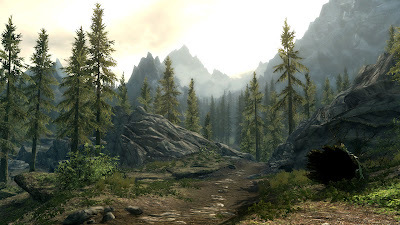 The landscape itself will be about same size than Oblivion, but high mountain ranges will block several walking routes making the map seemingly bigger. You should be able to climb to the most of the mountains. This will be good in case there won't be invisible walls like in Fallout: New Vegas which was pretty bad about that. Landscape will have six or seven totally different settings from greenier forest to frosty tundra (did I also recall word volcanic? Well cannnot promise). Also dungeons will have several different sets from icy caves to forts and more. Voice acting in Oblivion was varying quality. Some of the actors were good, but others just were not. They didn't have enought voice actors so you could hear same actor speaking guard's and dark brotherhood voices. There was just much repetition. This time Bethesda has also hired more voice actors to avoid this. 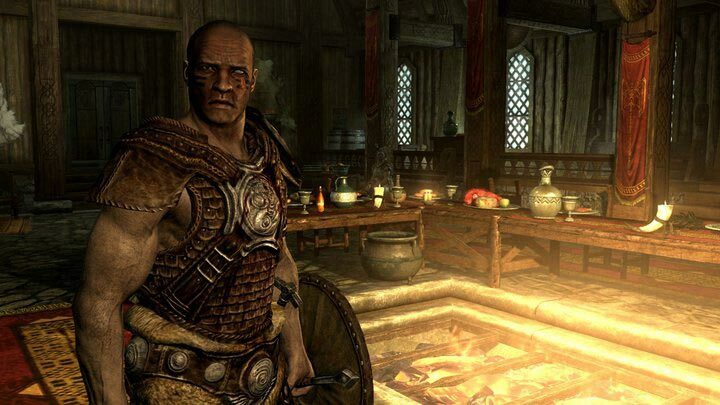 Todd Howard also promises more detailed character creation in terms of the character looks. Remember beard selection in Fallout? Perhaps this will be something along those lines, maybe scar-selection. All in all Skyrim sounds a huge game, leaning towards Oblivion more than Morrowind, but being more than just Oblivion 2.0. Im expecting as dynamic as possible adventure/RPG made for current generation consoles and I'm sure I'm going to spend many hours exploring the snowy lands of Skyrim. Live up to the hype or not? My bet is no - but it will still be a great game because all the hype is totally over the top - perhaps the game of the year 2011. Ganers Dungeon will be following Skyrim closely. -Whilst there isn’t a level cap dungeons will lock at the level of your first visit (to stop level grinding) – so save some for later!